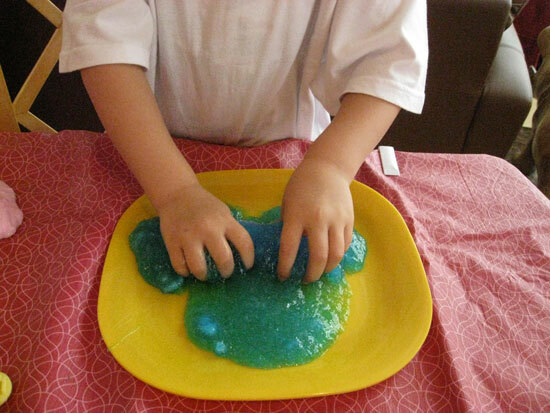 Goop and Gak; what a fun morning. The goop we used is a product I have being longing to try for quite a while. 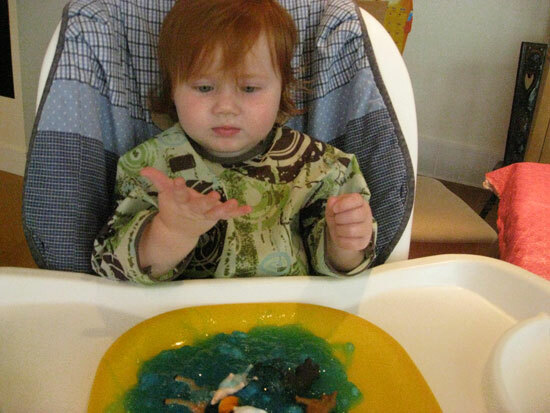 GobbledyGoop is a polymer and makes a slimy, stringy texture. It makes me think of Slimer from Ghostbusters. 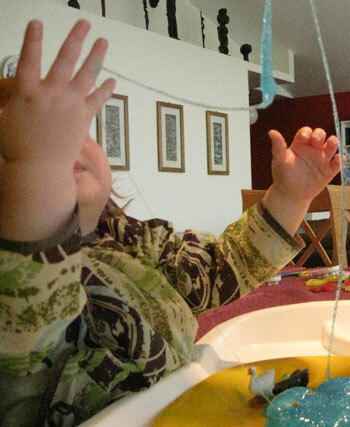 The big bonus for using with small children is that this product is safe and non-toxic. We poured 1/2 cup of water into a cup and added 5 drops of blue food colouring. The instructions said to slowly sprinkle in 1 teaspoon of powder while stirring briskly with a spoon. As you can imagine asking a four year old to sprinkle, let along sprinkle and stir is a challenge. We ended up with a couple of little lumps but they added to the experience. 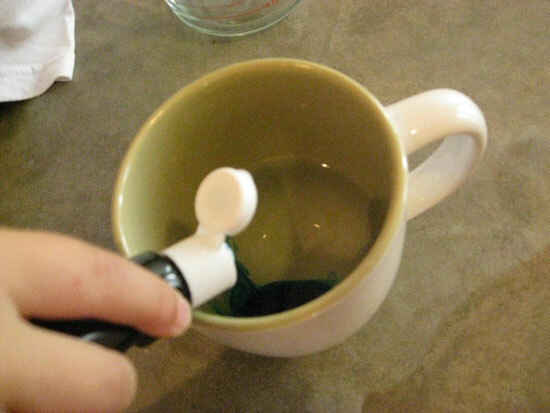 We added another cup of water while stirring and then another teaspoon of powder. I found stirring with a fork mixed better. It thickened when left for 10 minutes. 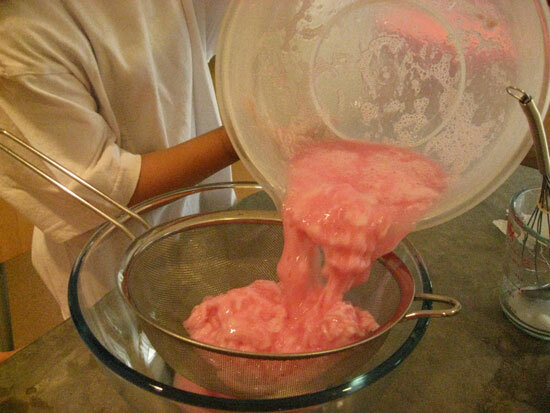 Adding more water makes a thinner, smoother slime and less water makes a thicker, clumpier slime. Daisy’s face was a picture when she first shoved her hands into the GobbledyGoop but I was too busy watching and forgot to take a picture. Rose had a mixed reaction and seemed a little disturbed by the feel of the goop. She loved watching me make strings by dropping it slowly from a height. We added some farm animals. Knowing it was non-toxic made me feel better about her playing but I did have to watch carefully to ensure it did not get eaten! I had a whale of a time playing but getting it off your hands and everything else is quite a challenge. I recommend lots of hot soapy water and supervised use, to keep the GobbledyGoop contained. Moving onto the gak. We made this while the GobbledyGoop was setting. 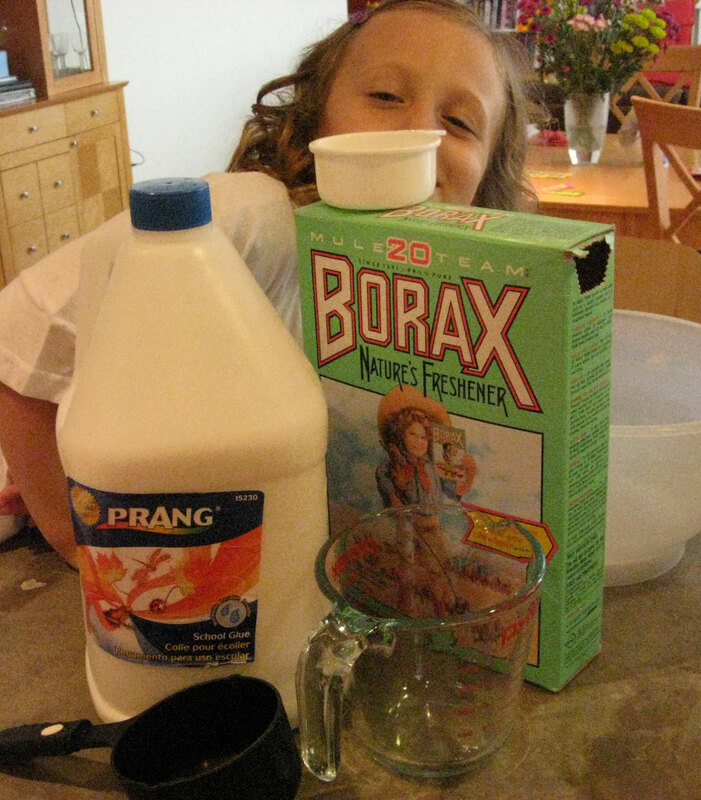 The recipe is from Kid Activites and I always have Borax on hand for dirty diapers. It can be found in the grocery store with the laundry detergent. 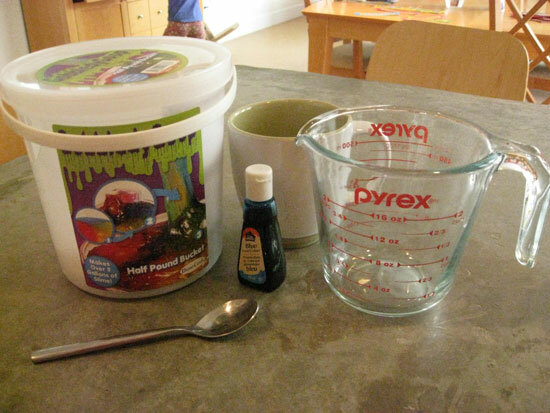 We mixed 1 cup of water with the borax and added 5 drops of red food colouring. 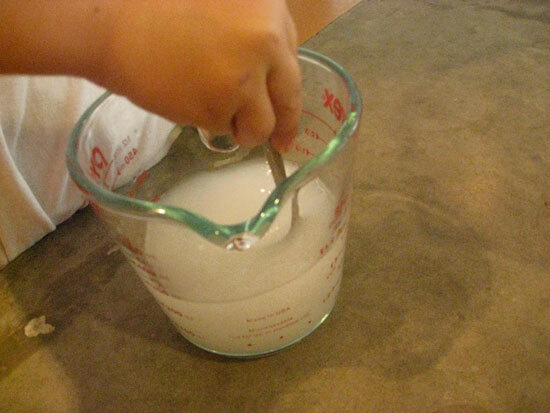 In a separate bowl we mixed the glue with 1/2 cup of water. Then we added the borax solution to the glue, lumps formed immediately. A sieve sorted out the issue and a quick knead made the gak come together. 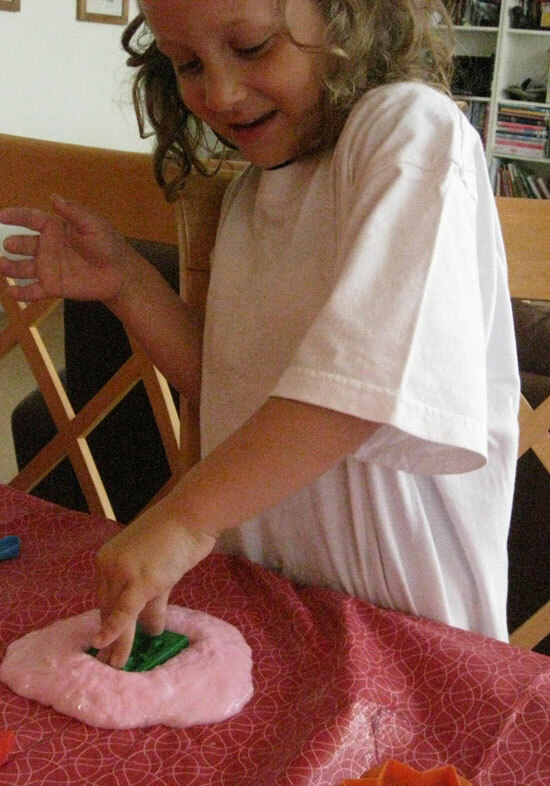 Playdough toys worked well with the gak and it cleaned up easily. The borax did make me rethink giving it to Rose but daisy had a ball playing. I think Goop and Gak have their place. 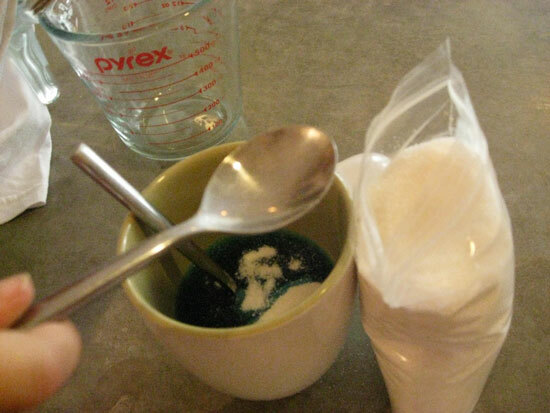 Gak is easy to make but the borax makes it not a favourable substance for children who are still likely to try eating things. The goop although non-toxic is difficult to clean up. I can imagine using it with upper elementary children during science. Example experiments are provided in the GobbledyGoop tub and it would be perfect to use when teaching solids, liquids and gasses. It will definitely make children think about substance properties. How would you use GobbledyGoop?